The Grand Hotel Europe is located is the heart of St.Petersburg, on Nevsky avenue, surrounded by some of the world's greatest cultural treasures, including the Russian Museum, the Hermitage, and the Mikhaylovsky Theatre. The hotel offers accommodation in 301 sumptuously appointed rooms and Suites completed with all the 21st century conveniences. In-room amenities include: a minibar, satellite television, a telephone with international direct-dial facility and voice-mail, fax modem line, a writing desk, comfortable armchairs, a safe, air-conditioning, a hair-dryer, heated bathroom floor, wireless Internet access on request. The hotel offers 210 Classic rooms featuring an entrance hall and one bedroom with a seating area. All rooms have Twin, Double or King-size beds with Swedish duvets and coverlets in clean pastel hues. Bathrooms are beautifully appointed with marble floors and floor heating. The Classic Standard rooms (88 rooms) face the inner courtyard. Their sizes vary from 23 to 39 sq.m. Classic Superior rooms (91 rooms) with great views of the renowned Nevsky avenue and the Philharmonic Hall have an area of 30 to 37 sq.m. Classic Deluxe rooms (18 rooms) facing the Arts Square and the Russian Museum vary between 32 and 37 sq.m in size. The Terrace rooms (17 rooms) are located on the top fifth floor of the hotel. All of them are Double rooms, similar in size to the hotel's Classic rooms, and feature beautiful terraces with views over the city of St. Petersburg. The hotel's Belle Chambres (21 rooms) are lovely Junior Suites, which retain the generous space and classical style of the 19th century. They vary in size and layout. The Belle Chambres are on average twice the size of the hotel's Classic rooms. All rooms have parquet floors, spacious seating areas with armchairs and a sofa, and large windows facing the historical part of St.Petersburg. These rooms range in size from 40 to 57 sq.m. The hotel's 24 Classic Suites may vary considerably in size and layout, but they all share the historical features that were carefully restored during the hotel's renovation. All Suites have an entrance hall, a comfortable lounge, one bedroom, and a large bathroom. They feature antique furniture. Their sizes vary from 47 to 73 sq.m. Most of them have King-size beds, others offer Twin beds. Executive Suites have accommodated figures of international stature, including several heads of state, as well as many notable artists, business leaders, entertainers and other celebrities. Each of the Suites comprises an entrance hall, a living room and a master bedroom with a bathroom. The four Executive Suites are all furnished with a Double bed and range in size from 53 to 77 sq.m. Additional amenities include a stereo system and a DVD player. The hotel's Presidential Suites, namely Lidval Presidential Suite, Rossi Presidential Suite and Piano Presidential Suite, are furnished in classical style with antique oil paintings, clocks and decorative ornaments. They feature a stereo system and a DVD player, and some also have pianos. The hotel's 32 historic rooms offer historical architectural features carefully retained in the course of the latest hotel restoration. Historic rooms include 13 Classic rooms, 8 Belle Chambre Junior Suites, 9 Classic Suites and 2 Executive Suites. Guests staying in one of the historic rooms will also enjoy butler service. The Grand Hotel Europe offers five restaurants, including L'Europe restaurant, Rossi's restaurant, Mezzanine Cafe, Noble Assembly restaurant, Caviar Bar & Restaurant, Chopsticks restaurant, and a lobby bar. 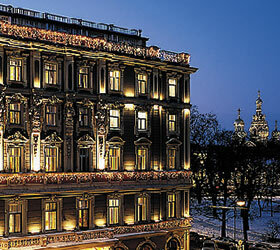 For more than a century the Grand Hotel Europe has stood at the centre of St.Petersburg's social, cultural and business life. Situated in the heart of the city's main shopping and commercial district, the hotel has long served as a venue for meetings, conferences, banquets, wedding parties and receptions. The hotel offers a wide range of public rooms, as well as a fully-equipped business centre, and experienced staff. The hotel can provide secretarial assistance, interpreters and translators, a private meeting room or a temporary office, as well as international communication via postal and courier services, fax, e-mail and Internet access. The hotel's wellness centre offers various types of SPA treatment, a gym, and a full range of beauty services. Exclusive boutiques and shops are hosted by the Grand Hotel Europe offering a wide variety of designer and luxury products.